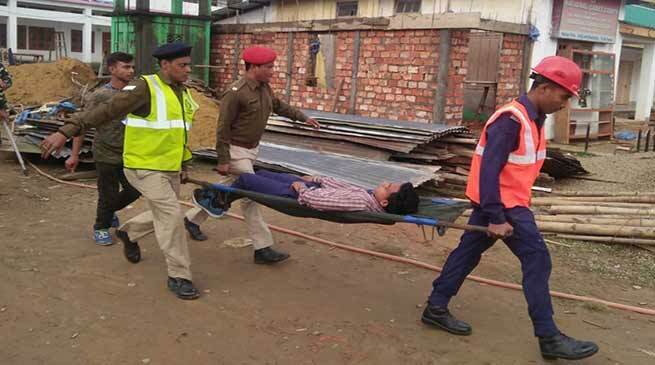 Along with the rest of Assam, mock drill exercise on earthquake was conducted successfully in Hailakandi on Thursday. The entire mock exercise began at 10 am simultaneously at five selected locations with the incident response system consisting of line departments, SDRF-NDRF personnel, fire tender personnel, police and civil administration working in sync to provide timely rescue operation to the victims vis-a-vis evacuating them to safer places and transporting the injured ones to the civil hospital for necessary treatment. The mock drill exercise was conducted simultaneously at the office building of Municipal Board, a residential building, SS College premises, municipal market complex and SK Roy Civil Hospital. The mock drill was based on a worst-case scenario of a 7.0 magnitude earthquake hitting the district headquarters and adjoining areas, and included ‘drop, cover and hold on’ exercises, as well as evacuations. Prior to the mock drill, the district administration assessed the level of preparedness at a table top exercise on Wednesday with Deputy Commissioner Adil Khan directing the concerned officials to pull out all stops to make the exercise a success. “The aim of the exercise is to sensitize the general public about safety measures they can take in case of an earthquake and other emergencies and also to assess the level of preparedness of disaster management authority and line departments,” said an official of the District Disaster Management Authority. Assam falls in high seismic Zone V with several earthquakes of high and moderate intensities rocking the State in the recent past.